Paryski Hotel Art & Business **** includes 61 comfortable apartments ranging from 22m² to 39m² and eight luxury apartments ranging from 50m² to 96m². Apartments enchant with style and fine details, stylishly matched wallpapers, high-quality fabrics, and fluffy carpets, as well as the selected furniture, lamps, and chandeliers. 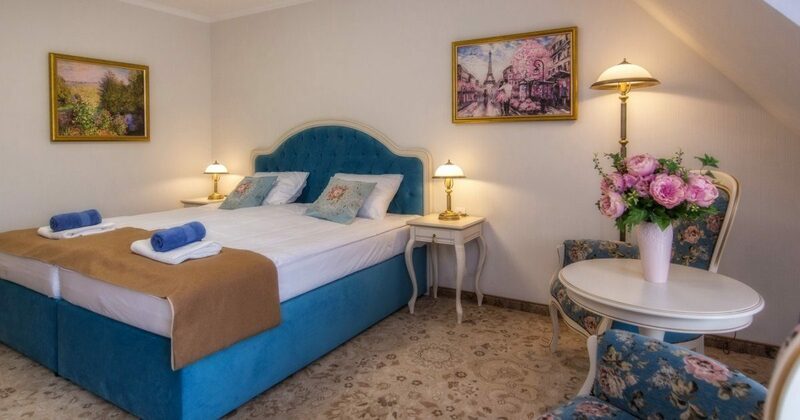 Find out how wonderful your rest could be in our unique rooms! The price includes excellent, rich breakfast, as well as the access to the wellness zone: swimming pool, jacuzzi, and dry sauna. Choose your room and check the details! Spacious, comfortable double rooms with the area of ​​21-30 m2 including bedroom, bathroom, and balcony. Spacious, comfortable rooms with the area of ​​23-28 sqm, including bedroom, bathroom, and balcony. Comfortable, spacious studio apartments, with an area of ​​33-38 m², are ideal for families with children. A Studio apartment has 2 bedrooms, bathroom, and balcony. One bedroom has a double bed, other bedrooms include two single beds. Deluxe apartments are elegant, spacious, luxurious apartments with an area of ​​49-52 m², consisting of a bedroom with a double bed, double sofa bed, bathroom, and balcony. Business Apartment is a very spacious and comfortable apartment, with an area of ​​70 sqm, which includes bedroom and a living room equipped with lounge furniture. The apartment has 2 bathrooms. One bathroom is located in the sleeping area, the other in the living room part. Luxury apartment of the highest standard, with the area of 93m2. Guest can use 2 bedrooms, a living room with a sofa bed, and 2 bathrooms: one with a bathtub, the other with a shower.